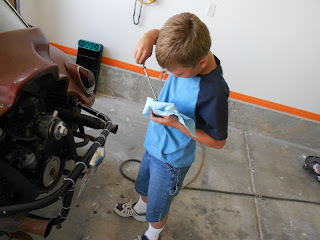 The Bug Boys: Having fun with Cub Scouts and Dumpster Diving? Having fun with Cub Scouts and Dumpster Diving? This weekend, Steven and I had a chance to work on his Handyman badge for Cub Scouts. He had to check the tires on his bike and a car, lube his bike chain, change a light bulb in a car and the house and change a tire and check the oil on a car. Volkswagen's are great to learn how to check the oil on because they always need some. Steven did great. I wish I had grabbed the camera earlier but I managed to get the oil and tire part of it. Steven actually checked the oil on both the bugs and added a 1/2 a quart in each one. Here he is checking the dip stick. I wanted to switch tires on the baja so I figured I would get Steven to do it so he could pass it off. He jacked up the car by himself and removed the tires on his own. We cheated a little bit because I let him use an air gun to remove the lug nuts but we have one so I figured why not use it. I did explain that if we were on the side of the road we wouldn't be using the air gun. 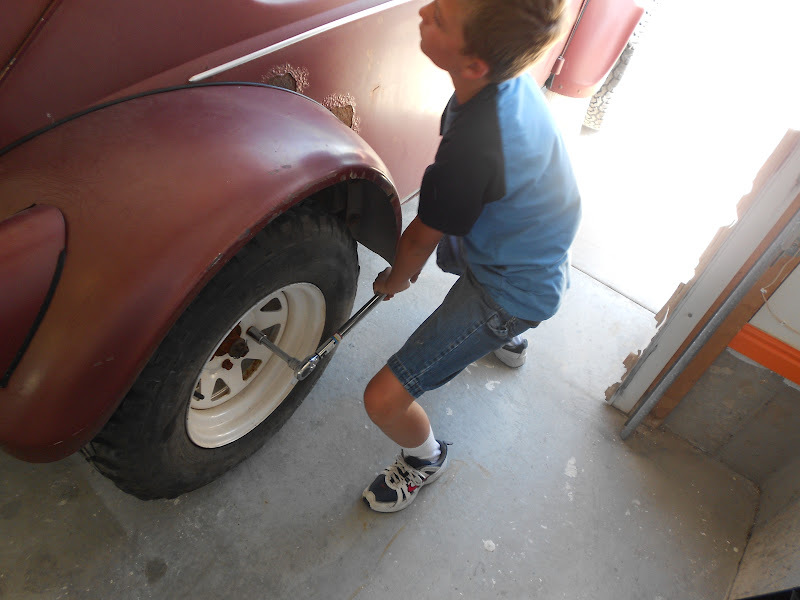 I helped him get the tire on and 2 lug nuts started and he took over from there. 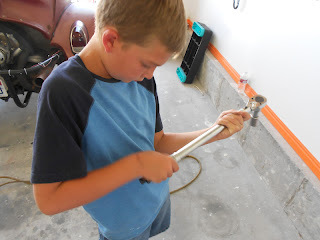 Here he is adjusting the torque wrench for the lug nuts to 94 foot pounds. When you weigh 80 pounds it's not real easy to torque something to 94 foot pounds. He put all his weight and muscle into it. Here he is finally getting it to click. 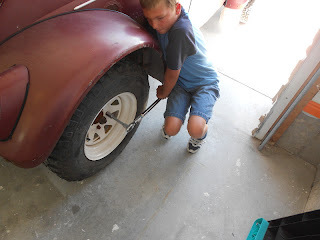 He did all 8 lug nuts and he looked like he had a good time. It was pretty hot on Saturday. The temp on our house thermometer showed 101 degrees. We took a break to drink some water. 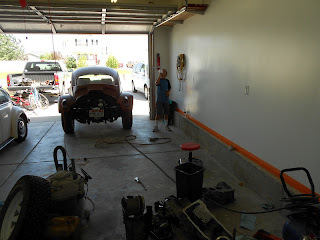 Steven changed the brake light on the bug because it wasn't working and it fulfilled another requirement. 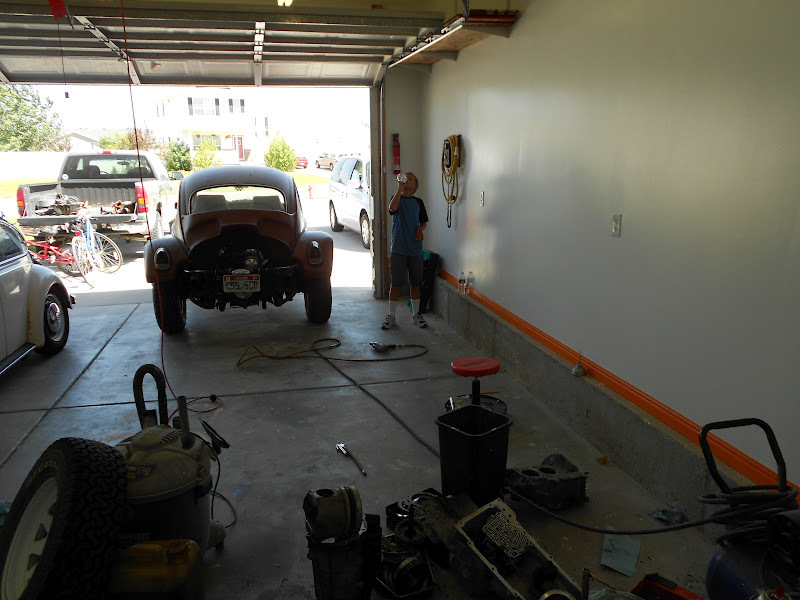 We had a good time out in the garage even in the high temperatures. Earlier in the week I was talking with a couple guys at work about scrap metal. I told them I had some I needed to get rid of along with a water heater. One of the guys mentioned that a transmission was dumped in the dumpster at work so I decided I would turn it in for scrap. We went out with the forklift to retrieve it from the dumpster. 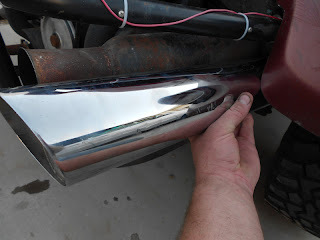 Along with the trans, I found a full set of exhaust off a victory motorcycle. I found out a guy from work was cleaning out their garage and decided to chuck all this stuff. I had a good idea on what I wanted to do with it after I found out they came off a victory motorcycle. I did some research and found that they came off a 1634 CC engine. It would work perfect. 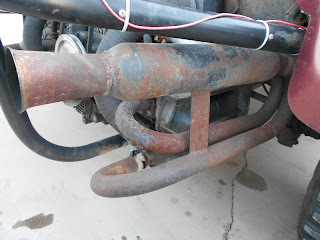 I had the idea to put them on the baja for exhaust. The neighbors are going to love me if I can get them to work. They will be a lot quieter then the bazookas I have on there now. I am pretty sure I can weld on a piece of the straight pipe off the header and then I can install the mufflers off the bike. This is what they should look like. They will look a ton better than the rusty noisy ones I have on there right now. I am excited to try to get these to work and the price was definitely right. Even if I had to go dumpster diving. 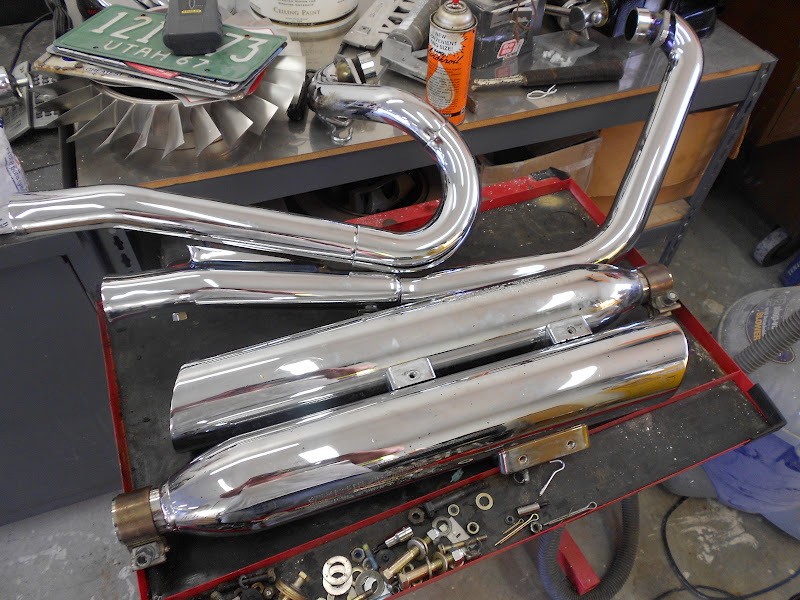 Stay tuned for the progress of the exhaust this week. I am keeping my fingers crossed that I can get it to work. The Stars must have aligned!